People who are born into families that own businesses have a head start on a career. 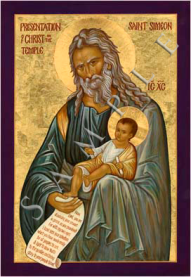 Simeon, born into the family of Jesus, surely had a head start on sainthood. But people who join families by adoption claim the same privileges as those who are members by birth. We are God’s children by Baptism, Jesus’ adopted brothers and sisters. We too have a head start on sainthood. Simeon, or Simon, appears to have been a cousin of the Lord. His father was thought to be a brother of Joseph and his mother a sister of Mary. He was probably one of those "brethren of the Lord" who were there in the Upper Room on Pentecost. He was chosen to be the second Bishop of Jerusalem when his brother James was martyred. The Christian community in Jerusalem had been warned of the coming destruction of the city by the Romans. When the uprising began, Simeon led the small community to safety in a town across the Jordan. They returned to the ruins, where they made a number of converts among the Jews. Eventually, the city itself was leveled and Simeon was sought out as a Jew and a Christian. Simeon, about 120 years old, died by crucifixion after being tortured.